While the discovery of iron ore would soon cause the ports of Duluth/Superior and Marquette to assume the role of Superior's preeminent ports, in 1850 the bustling fur trading center at La Pointe on Madeline Island served as the lake's hub of maritime commerce. Although the harbor at LaPointe was protected from deadly Superior Nor'westers by its situation in the lee of the Apostle Islands, and from Northeasterly blows by the body if Madeline Island itself, entry into the harbor was no simple task from any direction. Captains making for La Pointe from the east were forced to thread the needle through the narrow South Channel between Long Island and the southerly tip of Madeline Island, before swinging northwest into more open water, and thence to the harbor at LaPointe. Vessels wishing to avoid the South Channel by swinging around the northerly end of Madeline Island were forced instead to negotiate between the Madeline coast and Michigan, Stockton, and Basswood Islands before swinging south to LaPointe. Given the choice, almost all captains chose the route through the South Channel, since it was a considerably shorter distance. Shorter distances meant less time, and even in the mid nineteenth century commercial captains were only too aware of the fact that time was money. While making the passage through the South Channel under sail was difficult under the best of conditions, without the benefit of a light to mark the westerly tip of Long Island, the task was formidable under darkness or in thick weather of any kind. 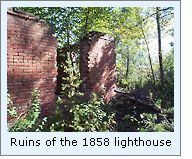 Wisconsin Senator Orasmus Cole took up the cause of maritime interests on February 8, 1851, when he presented a memorial before Congress on behalf of the Wisconsin Legislature praying "for an appropriation to build a light-house at La Pointe, on the southern shore of Lake Superior." Congress appropriated $5,000 for the construction of the LaPointe light on March 3, 1853, and by the end of that year plans for the station had been drawn up, a site was selected, and steps were underway to obtain title for the reservation. However, as a result of a series of government blunders, the light which was built in 1857 to satisfy the appropriation was mistakenly built on Michigan Island, and since no keepers were ever assigned to the station, it appears likely that it was never truly placed into service. To recover from the error, plans were quickly arranged to build a station on the northwestern end of Long Island, as originally specified in the appropriation. In accordance with the original specifications for the LaPointe Light, the station erroneously built on Michigan Island by Milwaukee contractors Sweet, Ranson, and Shinn consisted of a substantial stone dwelling and attached stone tower. Since all of the $5,000 appropriation had been spent at Michigan Island, there were no additional funds appropriated for the light now needed to be built on Long Island. As a result, construction costs were kept to a bare minimum through the erection of a simple wood frame combination keepers dwelling and light tower. Under normal circumstances, such an insubstantial structure would have been considered unsuitable for such an exposed location, however the Eleventh District was "under the gun" to deliver the station as authorized by Congress, and accommodations were necessarily made to recover from the error. Whether the costs of the new station were born by Sweet, Ranson and Shinn, whether or they were hidden within other projects being undertaken in the Eleventh District at the time, we have been unable to determine, however the LaPointe Light was finally built in 1858 on a slight rise approximately 400 yards from the northwesterly tip of the island. The clapboard-sided 1½-story structure was erected on a square timber foundation, and incorporated a short tower integrated into one end of the roof. With the top of the tower standing only 34 feet above the foundation, the octagonal cast iron lantern was outfitted with a fixed red Fourth Order Fresnel lens at a focal plane of 52 feet by virtue of the building's location on slightly elevated ground, in turn affording the light a visible range of 12 miles in clear weather. The combination of the timber foundation and the sand on which it stood proved to be problematic after only five years. High winds were found to be blowing the sand away from beneath the foundation timbers, creating an unstable condition through which it was feared that the building might soon be completely undermined and collapse. In order to effect a solution, a crew arrived on Long Island in 1864 and installed cast iron pipe supports on stone piers beneath the building to provide support for the foundation timbers. However, during his annual inspection of lights in the district the following year, the Eleventh District Inspector reported that the problem was not completely solved, and he recommended that the sand around the foundation be covered with a layer of broken stone to help minimize continued erosion. A contract was awarded for the procurement, transportation and installation of the crushed stone in 1866, but it was not quarried on Raspberry Island and delivered to Long Island until late in 1868, where all 50 cords sat in piles until the following year, when they were finally crushed and distributed around the building foundation. While the project took considerably longer than expected, it appears to have been successful, since in his report for 1869, the District Inspector reported simply that the repair was "effectual." With maritime traffic patterns changing to the north of Madeline Island, in that same year the Lighthouse Board decided to activate a fixed white light in the Michigan Island lighthouse, which had been sitting unused since its construction in 1857, and at the same time the characteristic of the LaPointe light was changed to fixed red, in order to better differentiate the two stations. 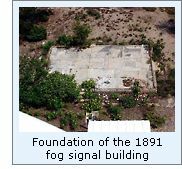 To help the station serve during pea-soup fogs which frequently enveloped the area, $15,000 was requested for a steam fog signal on the island in 1888, and while Congress granted its approval for the project that same year, it failed to appropriate the necessary funds for construction until March 2, 1889. A site for the new facility was selected approximately three quarters of a mile east of the Light, and contracts for a pair of ten-inch steam whistles and the necessary building materials were awarded. While all materials arrived at the Detroit depot early in 1890, clear title to the selected site was not obtained until late that summer, and thus construction did not begin until October, when the materials were loaded on the steamer RUBY and transported to the LaPointe work site. Likely as a result of unseasonably mild temperatures, work on the fog signal continued throughout the winter, was completed in January of 1891, and placed into active service with the arrival of an assistant keeper to the station in March of that year. The signal was assigned a repeated thirty second characteristic, consisting of a five-second blast followed by 25 seconds of silence echoing across the lake during thick weather. That first year, the signal was in operation some 189 hours, with the station's hungry boilers consuming 12 tons of coal. By the last decade of the nineteenth century, it became clear that the diminutive 34-foot tall tower of the LaPointe light was no longer serving the needs of maritime traffic passing between Madeline, Stockton and Michigan Islands. Located too far to the west, it was obscured by the southern tip of Madeline Island until vessels were almost on top of it. In 1890 the Lighthouse Board proposed that $7,500 be appropriated to replace the old light with a new 70-foot tall iron tower to be located next to the fog signal building. Since this new light would be located over a mile from the northwestern tip of Long Island, it was simultaneously proposed that a small light and fog bell be constructed on Chequamegon Point at the northwestern tip of the island to mark the full extremity of the south shore of the passage. Estimating that this second structure could be built for $2,500, the Board requested a total appropriation of $10,000 for the full improvements at Long Island. Since the LaPointe keepers would soon be responsible for two lights and a fog signal, it was also determined that a full-time assistant keeper would need to be assigned to the station to keep up with the workload, and thus additional living quarters would need to added. In an attempt to keep costs within the appropriated amount, it was decided to convert the existing LaPointe lighthouse into a duplex dwelling, since with the construction of the two new lights the old structure would otherwise no longer serve any purpose. To this end, the lighthouse tender AMARANTH delivered a work party to Long Island in the summer of 1896, and the entire LaPointe lighthouse was jacked-up, and a brick basement constructed beneath and the interior of the structure reconfigured to accommodate two keepers. Amazingly, the light atop the roof was kept in operation throughout the entire reconstruction, and thus the expense of building a temporary tower was also avoided. The old lighthouse thus remodeled, continued to serve as the only dwelling for the Keepers of the new LaPointe light station until the construction of a new dwelling close to the new light in 1938 as a Works Progress Administration project. At this time a work crew arrived on the island and built a large modern three-family dwelling close to the LaPointe Light and fog signal, permitting a more efficient grouping of the structures which made up the station. No longer serving any purpose, the old structure was abandoned, and without continued maintenance deteriorated quickly. Today, all that remains of the old LaPointe Lighthouse are the crumbling walls shown in the accompanying photographs. Click here to see a complete listing of all LaPointe Light keepers compiled by Phyllis L. Tag of Great Lakes Lighthouse Research. For five days in July, 2002, we were privileged to serve as NPS volunteers, assisting Park Historian Bob Mackreth in documenting the condition of all the Apostle Islands Lights, and visited Long Island in a Boston Whaler on the afternoon of our first day in the Apostles after spending the morning on Outer Island. Tying the boat to the concrete dock in front of the station, we first photographed the new tower, dwelling and oils storage house before setting off for the 3/4 mile trek to the ruins of the old lighthouse. It was 95 degrees that day, and the walk out along the ridge was difficult going since all remnants of the pathway were overgrown by stubby evergreens. We could see no evidence remaining of the concrete walks which used to join the dwelling to the new station, and could not identify whether they had been removed or were just hidden beneath the island sand and vegetation. After photographing the old dwelling, we made our way back to the dock, and spent the next ten minutes removing ticks from our legs before boarding the Whaler for the trip back to Bayfield. At this time, the LaPointe Light is the only lighthouse in the Apostles which is not open to the public on a regular basis. However, the island itself is open to the public, and with a private boat with which to land on the island, good views of the exteriors of the new tower, Chequamegon Point and the ruins of the remodeled dwelling can be obtained. PO Box 990 19 Front St. Recent photograph courtesy of Ken & Barb Wardius, Dan Tomhave & NPS. Historic photographs courtesy of the NPS Apostle Islands historians offices. Personal observations while on Long Island in July, 2002.